A trip to the supermarket involves a walk of about a mile in total; on the 11th August the temperature was around 30º and the humidity—according to my desktop widget—was at 32%. The result of that short walk, coupled with a similar time in the shop, which is cooled somewhat, is that my clothes need to go in the wash. If this is 30% humidity, I dread the very idea of the 90% I mistook it for. Today, 20th August, is advertised by accuweather as being 18ºC, “real feel” 26º, humidity 59%, visibility 4km. Visibility at ground level is more like a single kilometre, but I’ll agree with the rest. I have just walked to school and back; all of ten minutes and ten minutes wandering around trying to find a room open and or a colleague I can talk to. Back in the cool of my apartment, I realise that school doesn’t have any cooling and I doubt I can work well under such humid conditions. My trousers are damp, my shirt sticks where it touches and is showing unsightly damp patches already. I have ironed it dry, as I have too few shirts to choose another for today. I had packed a tee-shirt to replace the nice shirt with when it became unusable but I cannot see a way of being cool (or dry, maybe) enough to achieve anything approaching useful work in such conditions. And some lessons were in progress, in Chinese. I can see why one would want to have lessons very early, but already, at 0815, the conditions were way beyond anything acceptable in Britain. This is going to be a real problem. Never having experienced humidity before, I am confused by the effect on the body. Clearly the cooling mechanisms fail because the sweat is not evaporating as it would in drier climes. Why, though, is the perception that the ambient temperature is so high? Is that an experiential thing – does a local perceive more accurately somehow what is occurring and recognise the different effects of temperature and humidity? I have been out running daily for the last fortnight, whatever the weather. One expects to sweat. My singlet changes colour entirely, it can be wrung on return (disgusting) – even my socks can be wrung a little. The difficulty of heat loss is less debilitating than I expected and—it may be that I am acclimatising—I am running tolerably well at 30% humidity now. 60%, though, is a different matter. Not only can I not cope, neither can my clothes. There was a lengthy period while living in Cornwall when I was suffering from sunshine. All I had to do was walk across the yard to the car and back (without a hat) and my head was baked. Basically, the blood on the top of the head became too hot. The blood supply to the brain couldn’t take the heat away, and I spent subsequent parts of every day when I forgot a hat in hiding from the sun, lying down, waiting to recover, basically being utterly useless. Yet going for a run was not a problem, which was what led me to the conclusion about blood supply: If I got the body working soon enough, the heat was dealt with. Some time after that, not long before leaving Cornwall, the problem went away and I could happily spend large parts of the day outside being active or inactive without consequence. Total inactivity remained a problem—sunbathing is not my scene anyway—and lazing around without a hat returned the previous state. China has shown me some sunny days; I have seen blue sky and I have seen over 4km into the distance. I do not believe the air has been clear enough to see the (Pyrénées size) mountains a mere 20 miles away. I am beginning to wonder what the norm is for air quality but I can already observe that high humidity and poor visibility go together. Apparently Beijing is much worse. Time will tell. 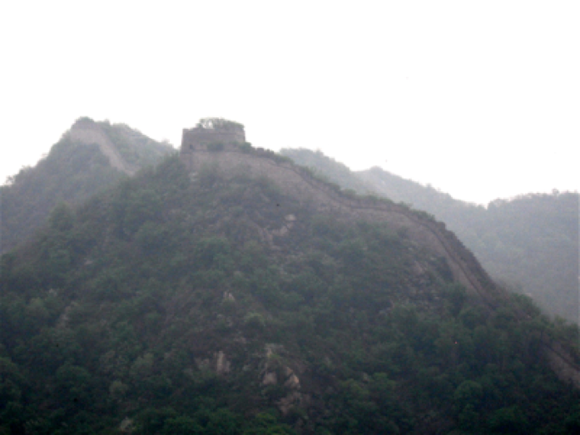 Picture at top of the Great Wall, not too far from Beijing. Taken by me.